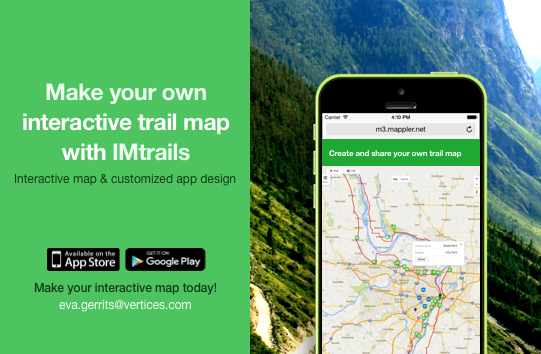 The IMTrails app for iPhone/Android is here! With the app, trails go virtual so anyone with a computer or smartphone can access and trail amenities, routes, and information. While on the trail, trail-goers can upload photos, tips, comments, and even fill out a customized survey form from their phones. Increase trail involvement, tourism, and promote environmentally conscious behavior! Contact us at eva.gerrits@vertices.com to learn more about getting your trail to go virtual!